We keep this page updated with the latest news about our planned events and other items of interest so please come back from time to time to see what's new. Oliver Cromwell, the Jews and the Second Coming - When? Two of our members have just produced a new 60-page book with the above title. It details how Oliver Cromwell, starting from humble beginnings, rose to become an MP at 29 years of age, eventually becoming the First Lord Protector of England, Scotland and Ireland, until his untimely death in 1658. The book tells how during this time Cromwell as Lord Protector was also engaged in negotiations to encourage Jews to return to England. The reason was not only he believed this would strengthen trade links, but also, somewhat surprisingly – if the Jews could be converted to belief in Jesus Christ, this would hasten his “Second Coming”. The Bible in English as a result of the Printing Press, had become more widely available and people were reading it – none more so than Oliver Cromwell himself, who was a devout Puritan. They were becoming aware of the central theme of God’s plan as being the Second Coming of Jesus Christ to the earth and the restoration of the Jews. Although Jesus Christ did not return to the Earth in 17th century as Cromwell and others expected, Bible Evidences are put forward for still urgently expecting it in these days and for being constantly READY. The book is available FREE of charge. Contact us if you would like a copy. In 1879 when Archaeologist Hormuzd Rassam was excavating in ancient Babylon he uncovered a clay object about the size of a rugby ball. The bottom section was covered with Akkadian hieroglyphics. The content of this inscription was a description of the attack of Cyrus the King of Persia on Babylon in 539 BC. The battle was fought near the riverside city of Opis, just north of the capital Babylon. The result was a victory for the Persians. A few days later, the city of Sippar surrendered to the Persians and Cyrus’s forces entered Babylon, which was eventually eclipsed by the Persians. How can that possibly be of interest to us nearly 1400 years later? First, part of the content of the inscription itself echoed precisely the words of Isaiah chapter 45 v 1-6 in the Bible. It was recorded during the lifetime of Isaiah BC 742 – 687. Second, the event itself did not take place for another 150 years – that is in 539BC. Isaiah’s writing in chapter 45 predicted this great event which was still 150 years in the future! Third, not only did Isaiah predict the results of the conflict 150 years in advance but he got the name CYRUS correct too! Christadelphians have believed since the mid 1850’s that the Bible is inspired — literally, “God breathed”. Recent articles indicate that we are living in “troubled times”. Improvements such as in education, information and travel are not providing the consolation in living that many people innately crave. This particularly affects the young. Two in ten feel that their life will amount to nothing however hard they try. The scourges of depression and anxiety affecting all are growing and widespread and are often more difficult to cure than physical disease. There is a call for as much resource to be put into mental health as into physical. An ongoing survey by the Prince’s Trust Macquarie for 2018 shows the latest “Youth Index”. This gives an annual measure of happiness and confidence in the main areas of young people’s lives including jobs, prospects, health and money. For the fifth year in succession the survey shows a continuing fall in the Overall Youth Index scores. Worryingly, two in ten young people think that their life will amount to nothing, no matter how hard they try. The trend of the Findings yields bleak prospects for the next generation. Recent improvements in so many ways - education, information and travel - are not providing the worthwhileness in living that people innately crave. “Christadelphians,” (‘brothers and sisters in Christ’), have since 1848 been highlighting the wisdom of the Bible message for everyday satisfaction and purpose. During this time, however, Bible teachings have been increasingly ignored. This advice is still applicable today. The wisdom and guidance the Bible yields will help to fill the emptiness of young people’s lives as reflected by many of the results in this Survey. Easter is the time when the death and resurrection of Jesus are remembered. We are holding special free events this Easter to remember this. Displays: Mary Jones and her Bible, English and foreign Bibles, Why the Bible is important to us, Aromatherapy, Herbs and oils used in the Bible. Cake and bric-a-brac stalls with all proceeds shared between the Children's Air Ambulance and the Christadelphian Bible Mission. Face painting and activities for children. Everything is free of charge except for anything you choose to buy from the stalls. On Saturday 31 March at 7.30pm. Join us for an hour to sing praise about the death and resurrection of Jesus. This event is entirely free of charge. On Sunday 1 April at 2pm we will be presenting a live performance graphically examining whether or not Jesus really did rise from the dead as described in the Gospels. We believe the whole Bible and we are perhaps unique in that we don’t rely on any other authority. One of our members explains that this is why, as a young man, he chose to be baptised and join the Christadelphian faith. He saw at an early stage that the Bible contains a reasonable and logical answer to such questions as what is the purpose of us being here and what happens when we die. The Bible is our guide. It tells us how we may obtain eternal life and it has God’s authority. The Easter programme is also set out here. The 2nd of November 2017 saw the 100th anniversary of the British government's issuing the “Balfour Declaration”. It announced support for the establishment of a “national home for the Jewish people” in Palestine. The historical impact and signficance of the declaration is far greater than its size of one sentence would suggest! As a step towards realising this objective on 11 December 1917 General Allenby made his formal entry into Jerusalem and Jews started going back to the land amidst threats and battles. Recently President Trump announced the USA's formal recognition of Jerusalem as the captial of Israel. This received enthusiastic support from some and angry opposition from others. Surely disputes about land take place the world over! Why is this so intractable? There is here a profound difference. Jerusalem is sacred to Jews, Christians and Muslims – perhaps 37 million people - all believing different things and all convinced they have their own stake in the City! Jerusalem means “City of Peace”, but after such a history can there ever be peace in that city? Will you be there to enjoy the peaceful kingdom? Some Stafford Christadelphians have produced a book called The Coming Peace in Israel. Find our more about the book here. In general the word “turmoil” describes a state of great disturbance, confusion, or uncertainty. If we think of world weather threats - hurricanes, earthquakes, floods, storms, and global warming - many would claim they have never seen such a combination of looming threats as we see today. In the UK the ferocity of storms is exceeded by political and international turmoil, anxiety and uncertainty. The effects of withdrawal from the EU have the potential to produce disturbance, division and confusion in UK – like the fear experienced during the dark days of WW II. Will this emerge through negotiations – at the United Nations for example? It will arise from the promised second coming of Jesus Christ to the earth, this time as World King. It will provide the basis for a genuine hope for everyone. An article appeared in the Mail Online on 27 July, with the headline “Bronze Age DNA disproves the Bible's claim that the Canaanites were wiped out...” It refers to a recent scientific study showing that present-day Lebanese people derive over 90 per cent of their ancestry from the Canaanites or a genetically similar population. It sets this against the Bible record of God's command to the ancient Israelite people to destroy the Canaanite people. It says, in effect, that since the evidence shows that the Canaanite people cannot have been destroyed then the Bible must be wrong. This is sloppy and misleading journalism. In fact therefore, far from disproving the Bible, the DNA evidence supports the accuracy of the Bible record. Towards the end of the article we find this rather more truthful statement quoting one of the report's authors: ‘Dr Haber, however, told MailOnline, they don't completely disprove the Biblical accounts’, which contradicts the article's own headline. A headline saying, “Scientific research does not disprove the Bible” would not, perhaps, suit the newspaper's style so well! We counsel our readers always to take great care before making judgements based on such reports. Sloppy journalism misrepresents and oversimplifies the results of scientific research. The researchers themsleves misrepresent the Bible account. Expertise in DNA and population genetic history gives them no qualification to pronounce on the accuracy of the Bible. We awoke on Wednesday to the distressing news of the growing tragedy in London. Fire had raged in the recently-modernised 24-storey Grenfell Tower. Many people are known to have died and hundreds more are left devastated by shock and with no home and no possessions. Jesus spoke of a tower which collapsed, killing 18 people. What was his comment? If we always please ourselves without taking God into account then we all will die sometime from whatever cause. If we obey what the Bible says and try to live a new sort of life now - “to repent”, we can be saved when Jesus returns. 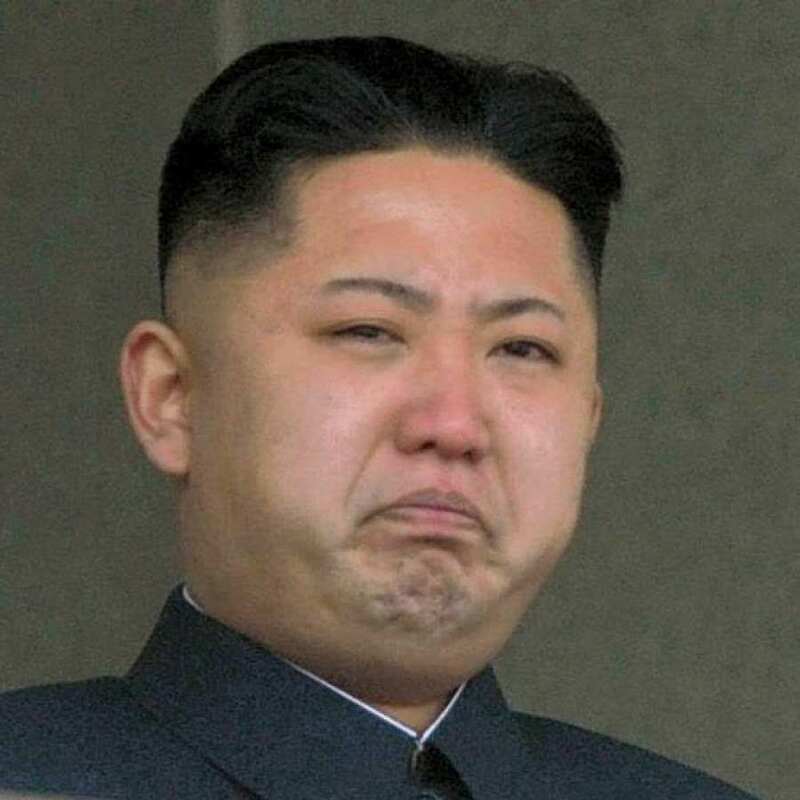 “Step back or it’s War”, says Kim Jong-Un. Once again the whole world holds its breath. Two countries, both possessors of nuclear weapons, square up to one other. 1 million could die in such a confrontation. Is it just a question of chance that the threat will not be resolved at the last moment and World War 3 actually breaks out? Will this emerge through negotiations – United Nations for example? A time of Judgement is to come – be prepared! 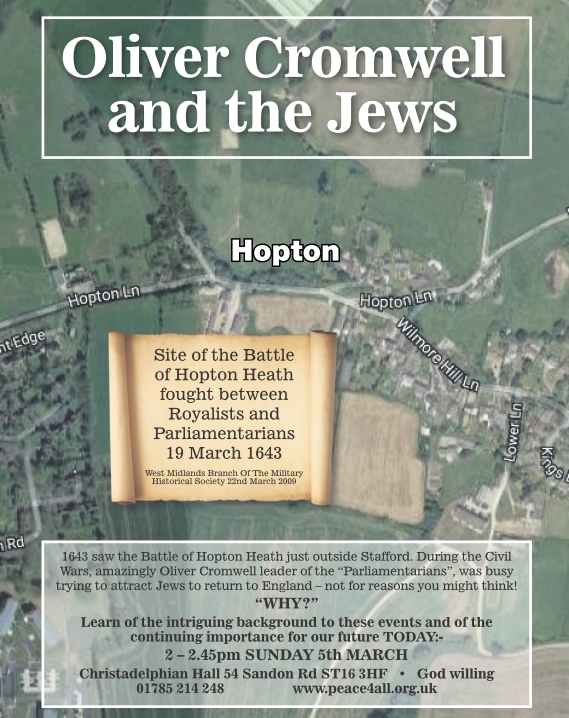 Hopton is famous for the battle of Hopton Heath during the English Civil War. It took place on 19th March 1643. The forces of King Charles I met those of Oliver Cromwell and the Parliamentarians. Many were killed. “OLIVER CROMWELL AND THE JEWS”. He actually believed - if they were converted this would hasten the “Second Coming”. You’ll probably say, “they’re on about the return of Jesus Christ again!”. We confess this is one of our central themes founded on the Bible. How that will affect you, your family and everyone else the world over. You can see the video of the presentation here. 2017 will mark the anniversaries of a number of significant events over the last 120 years — events which have played an important part in the fulfilment of Bible prophecies. February 1917 saw the first Russian Revolution begin the process which led to the withdrawal of the Russian Empire from the First World War and the establishment of the Soviet Union, events which continue to have a profound effect on our century and the future prospects of the world. The Communist Revolution followed in October 1917. On 6 April 1917, the United States of America finally entered the First World War, - an event which tipped the balance in favour of Britain, France and their allies. It also marked the point where the USA became involved not only in European affairs, but also eventually in the Middle East. 5 June 1967 was the day on which the Six Day War of Israel against its hostile Arab neighbours began, - a war which brought about the re-unification of Jerusalem, the first free access of Israelis to the Wailing Wall and the “occupation” of the West Bank of the Jordan. The 50th anniversary of this event is likely to be the most commented event of all the anniversaries in 2017 and offers an opportunity and a challenge in our preaching concerning the ongoing fulfilment of Bible Prophecy. 29 August will mark 120 years since the First Zionist Congress. This took place in Basle in 1897 and was largely the work of the pioneer of Zionism, Theodor Herzl, who in the previous year had published his book entitled The Jewish State, in which he set out the case for a Jewish State in Palestine. He recorded in his diary: “At Basel I founded the Jewish State”, a statement which ignored the hand of God in the affairs of men, but which demonstrates the conviction of Jewish leaders that they would return to their historic homeland. 31 October 2017 will mark the 500th Anniversary of the Reformation, being the day on which Martin Luther nailed his 95 Theses, setting out his objections to the practices of the Roman Catholic Church, to the door of the Castle Church in Wittenburg. This is regarded as the event which sparked the Reformation, which amongst other things came to stress the importance of God’s Word, - the Latin “strapline” of the Reformation was Verbum Domini Manet in Aeturnum, “The Word of the Lord endures forever.” It also stressed the importance of ordinary people being able to read and understand the Bible for themselves. This freedom and privilege is dear to the hearts of all Christadelphians. 2 November 2017 will mark the 100th anniversary of the Balfour Declaration, widely regarded as one of the key documents in the eventual setting up of the State of Israel. It gave a commitment from the British Government to the establishment of “a Jewish National Home in Palestine”, which was honoured after a fashion, despite the contradictory promises made to different Arab and Jewish nationalists in order to get their support. 40 years ago on November 19th 1977, Egyptian president Anwar Sadat visited Israel. This broke the deadlock in which Arab leaders had previously refused to make agreements with Israel and led to a peace treaty with Egypt on March 26 1979. Another significant landmark in the development of the State of Israel was the passing of United Nations Resolution 181 which called for the division of the British mandate into separate Jewish and Arab states. This took place on 29 November 1947, so this year will mark the 70th anniversary. Although it was afterwards overtaken by events, the Resolution marked the first acceptance of the right of Israel to have a state and was a fore-runner of the Two State Solution to Arab-Israeli Conflict much favoured by Western Nations in the last decade. Finally, December will bring two further anniversaries if the Lord remains away, both on 9th December. Coincidentally, 9 December was the day on which the First Intifada (uprising of Palestinians) began 30 years ago in 1987. This too has proved significant in marking the start of resistance to Israeli rule which persists to this day. Our thanks to John Botten of the Knowle and Dorridge ecclesia for this information. A New Year is a time of hope, an opportunity for a fresh start – and even a few ‘New Year resolutions’. I wonder what happened to the ones we made last year! As we start a new year it is natural to look back on the year that has just passed: we will all have had our own individual joys and sorrows. For some it may truly have been a difficult year, for others a time of new life and fulfilled dreams. On the world stage what a strange year it has been: a man once declared ‘unelectable’ is now the president of the USA; Brexit is on everyone’s lips, totally confounding the predictions of the pollsters; the war in Syria has once again drawn Russian forces into the Middle East; and thousands of refugees across the world are seeking safety and security. It is natural to regard these as all random events in a world that seems to be increasingly out of control, but the Bible tells us that these events are all part of God’s plan and that we can face the future with confidence. ‘Your will be done on earth as it is in heaven’ is not just a platitude from the Lord’s prayer, it has real meaning and significance for us in 2017. May Christ’s Peace be with you in 2017. Peace in Syria for 2017? It is being reported that Peace has at last been achieved in Syria. But for how long can it last? Since the beginning 400,000 have been killed in the conflict including over 700 medical personnel and thousands of children have been made homeless. The main cities have been reduced to bomb sites. But warfare has continued ever since. Will this bloodshed ever cease? After singing all those Carols at this Season, when will people realise that Jesus is to return as worldwide King of Peace which the Angels proclaimed at his Ascension? Make it a Resolution to find out more about prospects for Peace by reading the Bible for yourself in 2017. Apply for or download a free Bible reading planner to help you. Life after death — is cryogenics the answer? The judge in the case said he had been moved by the “valiant way” in which she had faced her “predicament”. The father’s view was “Even if the treatment is successful and she is brought back to life in, let’s say, 200 years, she may not find any relatives and she might not remember things”. This framework of HOPE with EVIDENCE is available to all who are prepared to look anew for themselves at Scripture. One of our members, Roger Turner, has just published an article demonstrating the accuracy of Bible prophecy. The author draws on recent astronomical research and calculations as well as historical documents to establish demonstrably accurate dates for the birth and crucifixion of Jesus and other historical events. He shows that the historical events are a precise fit with the details of the prohecy in Daniel chapter 9. The article was first published in the November 2016 issue of The Christadelphian and is reproduced here with permission. Read the article here. Recent discoveries have shed light on how the human body, consisting of some 37 trillion cells, is made and performs. A few years ago the human ‘genome’ was written down. Each genome contains all of the information needed to build and maintain a particular organism. Our DNA in the form of a double helix contains our genes, accounts for why we resemble our parents and carries hereditary information for everything from our height to eye colour. Many of these features are not “cast in stone!” Epigenetics is the study of mechanisms which are reversible and affect every aspect of life being able to switch genes on or off during our lifetime. Latest research suggests our thoughts, feelings, emotions, diet and other lifestyle factors exert epigenetic influences every minute of every day, playing a central role in ageing and disease. The Olympic Games, currently in progress, have a long history dating back as far as 776 BC. They were originally part of a religious festival held in honour of Zeus, king of the gods, and staged every four years in Olympia. Ratings for the London Olympics in 2012 made it the most watched event in history. This is not surprising. The range of expertly managed activities on offer – from the explosive energy and determination of Usain Bolt in the 100 metres, to Laura Trott in her velodrome heroics, makes for compulsive viewing. These triumphal events provide a very welcome diversion from other events. Refugees, terrorist problems and suffering affect millions of people the world over. Does it have to be like this? For bodily exercise profiteth little: but godliness [respect towards God] is profitable unto all things, having promise of the life that now is, and of that which is to come. Paul recognises that exercise and fitness is but transient at best. Only in seeking the eternal dimension for the future is lasting peace of mind to be cultivated. Why not think about changing your perspective on life to take account of the wisdom of Scripture and the glorious future offered? The pros and cons of voting in the recent Referendum were the subject of countless lines of print and hundreds of discussions in the run up to the day. The resulting debate on the consequences of what has happened has been no less intense. But is it possible that there is at least one further consequence which has had no mention whatsoever? Christadelphians read the Bible and this, interestingly, sheds light on these events in an unexpected way. 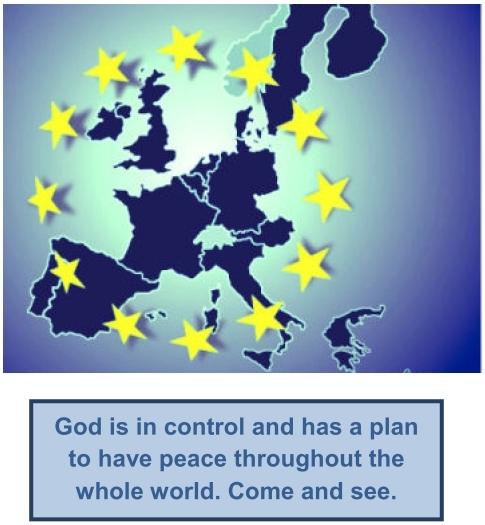 This article maintains that the outcome of the referendum is a fulfilment of Bible prophecy. That is surely an unintended consequence! For a Bible student the phrase “merchants of Tarshish” sparks recognition. The thesis is that Tarshish as used in the Bible is another name for Britain. How well can this be supported? The name Tarshish is used on several occasions in various parts of the Bible without direct reference to its actual location. The records are so consistent, however, that comparisons may be made giving further understanding. For example, the first occurrence of ‘Tarshish’ is as the name given to the Grandson of Japheth in Genesis 10:2,4. The sons of Japheth, according to historians, later migrated and came to inhabit part of Western Europe. Tarshish would be expected to be located there. This is one important factor consistent with Tarshish as being Britain. Later, in the Reign of King Solomon in Israel, extensive trade took place with a location called Tarshish - bringing gold and silver, ivory apes and peacocks to ornament his kingdom (2 Chroncles 9:21) BC 900 – 800. Herodotus the historian reporting on this trade, says they even circumnavigated Africa in search of valuable products to trade. Trading was therefore carried out over great distances, so Tarshish as being Britain, cannot be ruled out on account of distance. A little after Solomon’s reign one of his sons, Jehoshaphat, made ships for trade with Tarshish. To withstand the storms these ships were stoutly constructed and became known as “ships of Tarshish”. Several other references are made in scripture to “ships of Tarshish.” Britain, as a trading nation could well have been included. The record of the Prophet Jonah in the Bible is based on his journey to Tarshish. The record shows clearly that Israel’s port of Joppa on the Mediterranean coast was a long journey away from Tarshish and that therefore the sea voyage would have been in a westerly direction, although its actual location is difficult to work out. But neither is there any reason to rule out Britain from being Tarshish on account of distance. There is no doubt that tin has been mined in Cornwall for centuries and that availability is restricted. Tin was in great demand in the ancient world to make bronze. How much of this emanated from Britain (ie Tarshish) or from elsewhere is difficult to determine. But the occurrence of these four metals together, makes its source as Britain very likely. Herodotus describes it as, “from islands … from extreme regions”. Is there a reason for the vagueness of description? There is. When sources of valuable products were found the traders, not unnaturally, went to great lengths to hide them from competitors. There is further evidence for identifying Tarshish with Britain. It so happens that evidence of extensive trading was uncovered when the wreck of a ship was found near Salcombe in Devon. The significance of this find as reported in the “The Daily Telegraph” (15 Feb 2010) was that ‘the 3000 year old shipwreck shows European trade was thriving in the Bronze age’, (the period of the reign of King Solomon). Among other evidence is the fact that Tarshish in the Bible is associated with “merchants”. The extensive Commonwealth of Nations based on Trade is itself evidence of the unique strength of Britain as a trading Nation over many centuries. The above and a great deal more which could be said lies behind the opening verse above, Ezekiel 38:13, where the ‘merchants of Tarshish’ are mentioned. The verse predicts that this power will be separate from the rest of Europe — just as Britain has now become separated from Europe by the Brexit vote. The result is that Britain has now been freed to become involved in the great end-time battle of Armageddon at some point in the future, as predicted by Ezekiel in these chapters. Many Bible students have been watching out for this development for many years! HOW’S THAT FOR AN UNINTENDED CONSEQUENCE OF GREAT SIGNIFICANCE? Only time will tell how these things actually work out. But this small study serves to illustrate that there is a great deal more depth to the Bible than some people think. We believe it shows that there really is a God in Heaven who is working in our world towards the Kingdom of God on Earth. For more information contact us and ask for the FREE boklet, “The Destiny of Britain”. The EU Referendum — In or Out? You have probably have had a leaflet dropped through your letterbox from the Government to tell you that it believes that “voting to remain in the European Union is the best decision for the UK”. The answer is: We lack the necessary information to vote. We fervently believe, however, that the God who made the earth will decisively wish to influence the outcome. The course of future World history will therefore be profoundly altered. We would not want to vote to the contrary. The Government claims that to remain in, “is the best decision for the UK.” We believe the actual outcome (whatever it is) will not only be best “for the UK” but best for the whole world. This will certainly affect us all! You owe it to yourself to find out how God’s plan will affect you. in the Churchill Room at at Stafford Gatehouse Theatre, Tuesday 14 June at 7.45 pm. Refreshments after. People are suffering; how can we help? It sometimes seems that the world has gone mad! Millions are coming to consciousness after a fitful sleep hungry and aching in body and mind for absent relatives and friends. They find themselves in crowds on a journey of uncertain duration and unknown destination. For most of us the new day by comparison is good. But how do we live haunted by the suffering which surrounds us? Yet we feel powerless to help. But are we really powerless? So we each can pray that this time will soon come by Jesus' return. We can also react by foregoing some things so as to be able to contribute to the needs of others. It is customary to wish each other “Happy New Year” at this Season. Although each Year we are all aware of various problem areas in the world they are usually far enough away from us to be able to push them to the back of our memory. This year, however, we have become so much more conscious of the various forms of suffering around us particularly in the growing tide of migrants for which there seems to be no solution. According to UN figures there are 59.5 million displaced persons in the world. This figure has increased by 40% in the last three years. At this rate and with a growing population the world will become unsustainable. Have you ever asked yourself “Does it really have to be like this?” Can man not find better ways to share out the resources? The answer is No at the moment. But under a new organisation shortly to be introduced by the Lord Jesus returned from heaven, the answer will be Yes! Would it not be worth your while to explore such a possibility? After all there is little hope anywhere else. Our article addresses some of the questions that arise, especially from the Paris attacks. Two weeks ago saw the horrifying slaughter of 130 people in Paris. It is reported that the Bataclan theatre, where the majority of lives were lost, has Israeli connections. Hear the word of the LORD, O ye nations, and declare it in the isles afar off, and say, He that scattered Israel will gather him. The first part of the prediction has come true. The Jews have been scattered. The second part - the regathering is proceeding - the latest count of Jews in the Land stands at over 6 million. Great events are yet still destined to take place! We invite you to find out more by requesting a booklet and DVD called "The Coming Peace in Israel". It is entirely free of charge and we offer it with no obligation. Just click the link and fill in the form to request it. Where will the events in the Middle East end? This is all part of God’s plan and will affect everyone on the planet. Come and see an interesting presentation on what God says is the answer to the situation and how it affects you. The atomic bomb which was dropped on Hiroshima on 6th August 1945 – just 70 years ago - not only ended the Second World War but also destroyed some 129,000 inhabitants. In addition tens of thousands subsequently perished in nuclear related sicknesses and complete devastation of their cities. After the advent of the Nuclear age, such dreams seemed to become even more impossible. But God’s words here and throughout the Bible explain His unalterable purpose to bring Peace on Earth. To learn more please come along to one of our free Bible talks. Recent newspaper headlines have rarely lacked comment about how money is interfering with the “Beautiful game”. The President of Fifa has been urged to step down from his Office due to the many claims of “fixing” world sports venues. Bribery and Corruption is described as the misuse of power or wealth for private gain. ... Every man hunts his brother with a net. That they may successfully do evil with both hands — the prince asks for gifts, the judge seeks a bribe, and the great man utters his evil desire; so they scheme together. He went on to predict that man’s corrupting ways will one day be swept away from the earth by God’s intervention. To learn more about that future age please come along to one of our free Bible talks. What is the Pilot Thinking About? Following the recent tragic crash of the Germanwings airliner and subsequent revelations about the co-pilot Andreas Lubitz it would be entirely natural to have such thoughts. No one knows what others are thinking. How vulnerable we are to the thoughts and intentions of others! For as he thinks in his heart, so is he. "Eat and drink!" he says to you, But his heart is not with you.. The history of the ancient nation of Israel and its survival into modern times can be seen as a fulfilment of the Hebrew prophetical writings in the Bible. Some 3,500 years ago the Book of Deuteronomy predicts that the people of Israel would be scattered out of their own land as a result of their failure to keep the covenant of God. Further, that they would be dispersed into all countries of the world until, in what the Bible describes as “The LAST DAYS”, they would be regathered to their original land again. Millennia later, namely in 1947, with the Jews having survived terrible persecutions throughout their history, as an identifiable people they set up the State of Israel in 1948. As a result of the clear predictions of scripture, many well-known writers did indeed expect Israel to return to their original land one day. For Sir Isaac Newton in the 1600s, the Jews, “rapidly became one of the central themes of all Bible prophecy.” Newton had no doubt that the letter to the Romans chapter 11 in the Bible, spoke of the ultimate turning of the Jewish nation back to God, not simply as individuals, but as a people. Newton noted that the Jews had been cut off for disobedience but asserted that, “God would restore them again”. The Bible clearly shows with that long-foretold return of the Jews to their own land, there would develop a time of trouble in the world. Zechariah in his 12th chapter describes it thus “And in that day will I make Jerusalem a burdensome stone for all people”. When we survey the world as it stands today, few would disagree with the proposition that in the Middle East around Israel, is the greatest likelihood for further unrest to take place and indeed even the third world war to begin! If you would like to find out more about this fascinating and challenging subject come along to one of our Bible Hour presentations. In addition you could request, via the contact page, a free copy of the new book and DVD entitled, “THE COMING PEACE IN ISRAEL”. One of the consistent threads of history is shown in the anticipation and celebration of each coming New Year. The Romans originally dedicated the day to their god Janus — the origin of the month name January. The coming of a new year has always excited imagination and optimism. Looking back just 10 years, however, the optimism then for that new year was brutally overturned by the unprecedented images of the Asian Tsunami in which tens of thousands perished in a matter of moments. How about our position today for 2015? The omens are not encouraging. Recent headlines have highlighted the dreadful bin lorry accident in Glasgow when 6 people were tragically killed, showing the uncertainty of daily living. In this new year is there any direction in which we can look to develop some assurance in spite of this often-threatening future? Why not make the reading of a few verses of the Bible each day one of your New Year Resolutions? Christadelphians believe that the Bible is God's message to us and that the only way to understand God, His Son Jesus and our own lives is to read that message. Setting out to read the Bible can be a daunting prospect but for over 150 years the Christadelphian community has been using a reading planner that allows them to read three portions each day. By following this plan we read the whole Bible in a year, the Old Testament once and the New Testament twice. You can download your own copy of this plan from our Free Offers page. In recent times the Ebola virus causing the present deadly scourge has been responsible for various outbreaks in West Africa. So explosive has been its impact that by 29th October 2014 Ebola deaths amounted to 4951 and the death toll is rising at an exponential rate. Over the centuries there have been major plagues in various parts of the world probably caused by a related virus. Perhaps the earliest was the so-called ‘Plague of Athens’ in BC 430. Certainly the most well known was the Bubonic Plague which is possibly related to Ebola and may have caused the deaths of some two thirds of the population of Europe between 1347 and 1351. The Bible records various occasions when God sent plagues as a punishment for disobedience – the case of the numbering of Israel is one example (Numbers 21:1-17). On that occasion 70,000 of the people are reported to have died. Then he said to them, "Nation will rise against nation, and kingdom against kingdom. There will be great earthquakes, and in various places famines and pestilences. And there will be terrors and great signs from heaven... people fainting with fear and with foreboding of what is coming on the world. For the powers of the heavens will be shaken. And then they will see the Son of Man coming in a cloud with power and great glory. See our article "Peace - an elusive ideal or a realistic goal?". There's a Rugeley connection! See the list of future planned titles for Bible Hour presentations. Few of us can be unaware that 70 years ago on 6 June 1944 the so-called D-Day landings in occupied France took place. Over 4,000 ships and several thousand smaller craft formed the invasion fleet backed by up to 11,000 aircraft. During that day the Allies landed over 176,000 men in Normandy supported by over 10,000 tanks other vehicles and artillery. By the end of the day the allies had suffered more than 12,500 casualties and enemy losses amounted to 6,000 but the foundations of a victorious battle and the winning of the war had been put in place. After all these years we might ask ourselves the question was all the suffering and disruption worth it? Certainly there has been a wonderful period of peace in Western Europe in the time since. When we look round the world today we may ask the question are there good prospects of peace for us in the near future? It would be a supreme optimist who replied yes with confidence! Yet there is a place to look, which does provide a real prospect of peace both in our own lives and in the world at large. The Bible has stood the test of time Why not find out more about it for yourself? Request a free copy of the leaflet “What the World is coming to?” from the literature page. A collection of some older news articles.